Eco systems of good health, air, earth , community , security , peace – while this is what life on the earth seeks , within the infrastructure and walls of city- urban life , welfare activity seems infatuated , a growing awareness that all we have is a bandage that is trying to heal a big infected wound. A wound that festers from being blocked from consciousness, kept at a distance from nature, forced to become technology-dependent, locked into stressful work roles and insecure spaces – at home and in public spaces. Seven artists art installations conceptualised around wellbeing or the lack of it within the urban sphere of city life – ranging from environmental pollution, lack of play areas for the child , discomfort and insecurity of women in public spaces , lack of basic infrastructure like clean toilets on street level and urging to go back to Earth the natural way. Curated by Avani Rao Gandra, of Icon Art Gallery. Art installation by Avani Rao Gandra. A poetic dig on man bleeding the Earth. As we have one life so do we have one Earth, the stink of pollution we raise is subdued within the luster of plastic cities, the wind of the dead animals and fallen trees are anointed and plushed in glass facades. The buzz of city life silences the sounds of nature,the floating fish that die of toxins, the song of a hundred year old tree felled in seconds, haemorrhaging the Earth devoid consciousness nor conscience. Our lives are open books of personal choices we make in mundane life – In what we want to perceive or see. My art installation revolves around these simple choice we make in life. I’ve always found it interesting to explore and play with space, illusion and our existence. “You or me “- Metamorphic representation of placing the mirror or reflector to discontinue the tree reveals the constant change in focus we make to see the world around us. Either the priority is self “ME” or the rest as “YOU”. I would like to extend the experience with a quote of Rumi – “As you live deeper in the heart , the mirror gets clearer and cleaner”. We are made of Earth and go back to Earth someday. The ladder represents man’s aspiration’s centered around career, wealth, status. The steps that bring him stress, trauma and anxiety and ill health. The work raises issues of the purpose of living, the earthern toys and vessels seek a visit to prehistoric art and ancient ways of life and tradition bound living close to nature . Art Installation by Archana Rajguru Biswas. With this work I want to show care for the nature. In the process of urbanization trees are being cut to enhance human life. But we are forgetting that nature is the dominating force; in that force human is just a speck and in our utter greed we are forgetting to take care of the nature. With the yellow and red thread warping around the tree I want to symbolize care, a tender hug to protect the gift of nature to mankind. Requesting visitors to hug the tree. The art work speaks about the how women are harassed in public and private spaces. The male gaze that discomforts a woman, her choice of attire and identity in her body language. I hope to show the pain and uneasiness of women through these pieces of clothing that reflected visually by cigarette burned, torn and burnt clothes and retaining a certain sensitivity through flowers and gloves. The Public Toilet installed has alert mechanisms that sounds out a warning. The ugliness in using advanced technology to shoot videos discreetly or under pressure tactics and body shaming women through videos and MMS speaks of increasing insecurity for women in urban spaces. 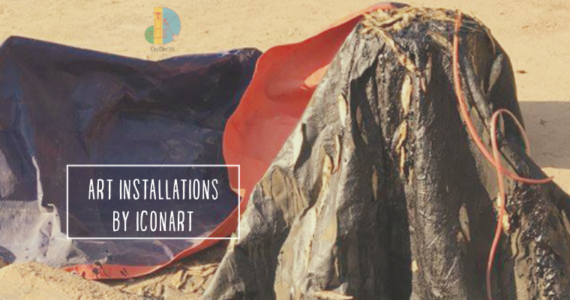 The installation hopes to be aware and to sensitize these issues . My concerns have always revolved around social issues and the immediate surroundings. Avani Rao Gandra is an old friend of Do Din. Year after year, she brings curated work to display at the venue. Please come and enjoy.